Carmen Reinhart has written an interesting article -- "The Perils of Debt Complacency." It's interest is probably not for the reasons Professor Reinhart intended. From my perspective, the article consists of a jumble of empirical observations, that bear no relation to her policy message. This allows me to infer what I think is her theoretical framework. My guess is that she believes that government debt levels are "medium-term neutral" -- a technical term that I have just made up. (The concept may already exist under another name, but since I am not an academic, that's not my problem.) Unfortunately for mainstream macro believers, they also believe in this concept. 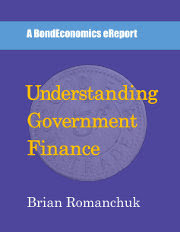 Since I have written a book on government finance, it would have been very easy to accept the article at face value, and attempt to debate her assertions. I believe that such an approach is pointless; a non-expert reader has no way of judging the relative importance of the various points, and may just accept the authority of a Harvard professor. The following are what I think are the key empirical observations that she makes in the article. "I cannot read How to Pay For the War and conclude that Keynes thought that high war debts were a “scarecrow” for the United Kingdom. In fact, the apparatus of the Bretton Woods arrangements that Keynes subsequently helped to craft were designed to ease a difficult transition out of debt." "Our research considered 26 high-debt episodes between 1800 and 2011, looking both at growth rates and at levels of real (inflation-adjusted) interest rates. In 23 of these high-debt episodes, growth was lower, and in eight growth slowed even as real interest rates remained about the same or edged lower. Japan’s debt overhang (entirely domestic currency debt), which we trace back to 1995, illustrates this pattern." "Our 2012 study identified three ongoing public-debt overhangs that began in the mid-1990s – Greece, Italy, and Japan. Relative to other advanced economies, these three economies are the worst growth performers (see chart). To be sure, a country’s economic performance depends on many factors. But the view that it is low growth that causes debt to rise, though important when assessing the cyclical feedback effects, can hardly explain the two-decade experience of these three countries." "Skidelsky needs no reminder of the historical record, but it bears noting that more than a dozen advanced economies received debt relief in one form or another during the depression of the 1930s." Anyone familiar with the Modern Monetary Theory literature (and my book fits within the Modern Monetary Theory framework, although I used more mainstream terminology) would immediately point out that she is lumping countries that control the currency they issue debt in with those with external constraints (euro area, Gold Standard). This theoretical problem has been raised innumerable times over the past years when debating the work of Reinhart and her co-authors; she continues to completely ignores those complaints. Instead of chasing the tail of rebutting the interpretation of empirical observations, I will instead follow a different tack: what does she have to believe in order for her observations to be coherent with some form of a theoretical framework. I describe my guess below -- which also describes most modern mainstream ("neo-classical") thinking about fiscal policy. Since the rest of the mainstream shares these assumptions, it may be reasonable for her to assume that these are self-evident truths that need to be plugged into an op ed. To be clear, I am using my own definition here, and this is not based on an extensive textual analysis of Professor Reinhart's article. Therefore, I am not saying that she agrees with the entirety of my description of "medium-term debt neutrality." Although this might be unfair, Professor Reinhart could perhaps write a theoretically coherent op ed next time so as to clean up the interpretation. The following is broad definition for the concept, which needs to be tailored to your precise theoretical framework. Definition Government debt is medium-term neutral if the government can set the (expected) level of government debt [or the debt-to-GDP ratio] to any arbitrary level over the medium term[see note], while respecting behavioural constraints [for example, inflation target, avoiding depression, etc.] and "target" economic variables will always converge to coherent steady state levels as a result of monetary policy. The assumption is that there are no "structural changes" to the economy. The "medium term" is vague; if one wants to be more precise, the definition is specified in terms of a fixed horizon; that is, we can speak about "5-year neutrality." For example, I would use "5-year government debt neutrality" as the "medium term." The horizon does matter; I doubt that the economy is "5-year neutral" (as discussed below), but I am agnostic on "20-year neutrality." The "target economic variables" depends upon the usage. As an example, I would suggest the unemployment rate and inflation. "Structural changes" would be changes to government policies that are not covered by standard economic models; non-structural changes would changes to interest rates, or tweaking "the" tax rate in an aggregated model. Depending on your views about New Keynesian theory, such steering is essentially costless. Even if fiscal policy changes cause short-term changes to demand, monetary policy (and the expectations about monetary policy, yadda, yadda, yadda) will offset those fiscal policy changes. In other words, the government-debt-to-GDP ratio in the medium term is entirely the result of whims of fiscal policy maker, and they do not matter. It is purely an aesthetic choice, such as my choice between wearing a leather jacket or a lumber jacket. Since steering government debt ratios does not matter, we can see why Professor Reinhart believes that she is free to apply observations taken from countries with currency pegs to countries that have control over their currencies ("currency sovereigns"). To return to my previous example, whether or not I am a currency issuer has no bearing on whether I wear a lumber jacket or a leather jacket. Furthermore, if we assume that government debts levels do not have a positive effect on growth, reducing the debt ratio purely on precautionary grounds seems entirely reasonable. From a post-Keynesian viewpoint, it is very easy to raise strong objections to medium-term government debt neutrality. As someone within the post-Keynesian camp, why the concept fails is self-evident, and does not need explaining. Interested readers will have to look in my other writings (or elsewhere in the literature) for more background. Fiscal policy matters. The idea that the effective multiplier on government spending decisions is zero (even taking into account the action of monetary policy) is viewed as self-evidently wrong. "You can't get there from here." This is related to the previous. The decision to launch an austerity programme when the economy is weak can push the economy into a near-permanent slump (for example, see the euro periphery), which means that we cannot return to the same medium-term outcome as the "no austerity" scenario. Mainstream models assume that the model state will return to "equilibrium" by at least the medium term. Mainstream economists do discuss "hysteresis," which captures this effect. However, "hysteresis" is just a fancy way of saying "mainstream models are theoretically deficient." Within the post-Keynesian literature, one can see statements to the effect that the government debt level is out of government control ("endogenous.") I believe that is certainly true in the short term (keeping in mind that governments can tweak deficits during an expansion). In the medium term, I believe that the government can steer its target debt level -- but it needs to make structural changes in order to achieve such an objective. The argument that government debt levels are endogenous implicitly assume no such structural changes are made. Although individual mainstream economists may make statements that contradict medium-term debt neutrality, they are cutting against the grain of their theoretical framework. As a result, such arguments are at best confusing. If we take the standard Dynamic Stochastic General Equilibrium (DSGE) from before the Financial Crisis (for example, Smets-Wouters), fiscal policy disappears completely; "Ricardian Equivalence" is invoked to explain this. In such models, the model economy is obvious neutral with respect to government debt on any time frame. Even in models which target fiscal policy, the debt level does not really matter. Take as an example "Optimal Fiscal Policy." I am not an expert on that literature, but the sole role of government debt is the effect of interest payments on tax rates in equilibrium. Within the theory, a standard result is that the "optimal policy" government should hike taxes in the short term, to drive net government debt negative. (Which presumably represents the central government hoarding private sector debt.) Such a policy would be considered self-evidently insane by post-Keynesian economists, and frankly, most real-world politicians. The "zero lower bound" literature created a role for fiscal policy in DSGE models (when the policy rate is stuck at zero). However, in the medium term, it should be possible to drive the policy rate away from zero, and we are back into the regime where government debt is again neutral. As a result, most mainstream complaints about Reinhart's policy advice (which is unclear to me --- we should wring our hands and wail about the unfairness of the world?) end up being only tactical disagreements. "Sure, we should reduce debt levels, but austerity right now is a bad idea because [insert reason]." The theoretical irrelevance of government debt levels also helps explain how attitudes towards government debt change according to the political cycle. Democrat-leaning economists can push for infrastructure spending when there is a Democratic president, but yelp about "bond market vigilantes" and "debt sustainability" when a Republican president cuts taxes. Republican-leaning economists generally hate anything associated with government, particularly debt, but can excuse deficit-increasing tax cuts by Republican presidents on supply side grounds ("tax cuts to job creators are self-financing"). Since government debt levels do not matter from their theoretical perspective, such an apparent inconsistency is easily explained. Although it would be easy to dispute Professor Reinhart's interpretation of events, I believe it would be more useful to determine what framework makes such an interpretation reasonable. The fundamental problem is that mainstream economics refuses to take fiscal policy seriously. Government debt neutrality is a strong property; just assuming it to be true is not a particularly "scientific" approach. "Finally, we investigate the idea of a threshold effect, or ‘tipping point’, in the relation between debt and growth. Reinhart and Rogoff argue that the negative correlation increases after the level of debt exceeds 90% of GDP. Herndon et al. (2013), as well as Eberhardt and Presbitero (2013a) attempt to refute the existence of such a threshold effect." The proximate causes of economic expansion are favorable natural events, government deficit spending, greed, and confidence in the collective decision to validate past investments with current investments. The question for me is pragmatic. What government and market behavior patterns cause an expectation of future profits or capital gains? What patterns cause an expectation of future loss? What government and market behavior causes economic saturation such as witnessed in Japan? What causes governments such as Ireland and Greece to increase debt to bailout a financial system and a bad economy? Correlation models give little or no insight into collective behavior patterns and decisions which are the driving factor in future outcomes. Technically, the search for a "tipping point" would appear to be a violation of debt neutrality. However, the alleged effects were small. Furthermore, the implicit policy advice (avoid the tipping point) implies that the government can freely steer the debt ratio. "Definition Government debt is medium-term neutral if...............................result of monetary policy. The assumption is that there are no "structural changes" to the economy." Under my version of mechanical Modern Monetary Theory, the assumption would always be incorrect. The correct assumption would be that additional debt ALWAYS causes structural changes to the economy. The reason is easy to see. Added debt increases the money supply as measured by the amount of deposits. This is always a structural change in the economy because the amount of claims on the remaining physical assets in the economy has increased. We can think of "money" as if it were a gift certificate. When there are more gift certificates floating around, there will be more claims on the remaining goods in the store reachable by gift certificate exchange. These remaining goods have already been paid for, they are just awaiting claim by gift certificate presentation. Is it a reach to learn from an analogy of money to gift certificates? Maybe and maybe not. A store owner who sold an amount of gift certificates equal to the entire inventory in his store would have a terrible task of predicting what stocks should be on his shelves and when they would trade. That is not how "structural change" is normally interpreted within economics. There are fairly formal definitions, where you are testing whether a regression model no longer applies in a new time interval. I am using it loosely, but the idea is that something has changed, so the operating characteristics are different. For example, a protectionist policy would greatly interact with how an economy interacts with the foreign sector. Old rules of thumb how economic variables interact might be invalidated. Returning to the article subject, one example structural change is that I think that countries would need to go after how pensions are provided in order to reduce debt levels. Changing the amount of money happens continuously, and so it cannot be considered as launching a new regime -- as all regimes would be extremely short-lived. Your association of pensions with debt and gift certificates fits well into this discussion. In fact, it reminds me of a valuable gift certificate that I won at a meeting but never used. It remains in my to-do bin to this day. The gift certificate was a float plane flight over the nearby coastal region worth about $450. Of course it was prepaid. I just needed to present myself and take a ride. But I never did present myself. Now if that airplane ride was a pension plan and I had been given one pension plan each year, I would have saved several rides after several years--all prepaid. The airplane owner would have had an income for each of several years from sale of gift certificates. Hmmm. How should he prepare for the possibility of a large number of gift certificate presentations at an unknown time? I would suggest that each NEW gift certificate or each NEW money certificate DOES change the present regime. Each new certificate transfers CONTROL of ownership from present owner to a NEW owner. Owners are decision makers so we see a shift in management with the CREATION of every NEW gift certificate. Roger, your gift certificate might entitle you to one free flight regardless of the current price of that flight. It may have gone up or down in price in the time between the certificate was purchased and the time you present it, but that shouldn't matter for you. Money is a bit different. Had you won $450 in cash and chose to keep it in your pocket for several years you probably would not expect to be able to redeem it for the same quantity of goods as when you originally received it. So I think a gift certificate for say 5 large pizzas is a totally different thing from a gift certificate for $100 towards a meal at a restaurant at the time you redeem it. The $100 gift certificate is much closer to money, but still not the same. Some might say that that there should be no difference between the two types of gift certificates, but I don't think that is how money works. Or how it should work for that matter. (v) a steady dosage of financial repression accompanied by an equally steady dosage of inflation. Options (iv) and (v) are viable only for domestic—currency debts. more than one of these channels." This FRED graph of Gross Federal Debt in the United States has a nice set of slider controls. By adjusting the window to the period 1939-1980 we see the debt increased to finance world war 2 and remained roughly constant from 1945-1960. So there was no liquidation of the stock of debt measured in dollars although the purchasing power of those dollars might have been reduced by inflation. Since government debt levels only seem to rise in modern nations I need to decide whether to spend time trying to understand what the authors mean by "liquidation" and "financial repression." What she calls "financial repression" Is what Minsky and I call "running a stable financial system." High government debt holdings stabilises private sector balance sheets. Minsky teaches that the post-war markets were awash in Treasuries. I think he prints a chart showing T-securities are as high as 12% of bank assets just after world war 2. As I'm sure you know the simplest model for the liquidity cushion of the banking system is to add reserves at the central bank to the aggregate bank holding of domestic Treasuries. Minsky teaches that banks develop and rollover liabilities to clear payments, however, in a money market crisis or bank panic, some banks cannot develop such liabilities, and would be forced to reduce the size of the bank balance sheet while clearing payment by selling down T-securities from the liquidity cushion. Thus banks are more stable with a larger % of assets in a liquidity cushion. Warren Mosler criticizes Quantitative Easing as a tax. I do not have time to decode the terminology used by C. Reinhart, but it seems to me that even though QE done with non-banks significantly increases the liquidity cushion (financial stability) of the system such system-stabilizing actions by government can be characterized as a tax or some sort of repression. QE done with nonbanks adds excess reserves to the liquidity cushion which earn interest, but not as much interest as may be paid to the central bank on its asset portfolio under QE. Thus it is common for experts to see the government as repressive when providing liquidity services if at the same time there is either low growth in the market sector or too much inflation. Discussions of this sort seem to be driven by an opinion about a counter-factual scenario that solves some social optimization problem in the mind of the critic. The critic does not usually state what he or she wants to optimize, and does not usually make a compelling case for the counter-factual scenario.